Spring Snow Goose hunting is unguided with the hunter supplying his own decoys, mobile blinds, calling, camouflaging and shooting skills. And, the key element to success, a willingness to do his homework following state and national migration reports then scout. The requirement to be a self guided hunter and to have the wherewithal in terms of skill and equipment results in fewer hunts in the Association than that through a guided operation. Another impact is the majority of the Association waterfowl hunters achieve the satisfaction of having hunted enough during the regular duck season they do not feel the need to continue. After the regular waterfowl season most take a break resuming their Association hunts with turkey. Those hunters that do enjoy recurring hunts will find much value in the Association. Aspects of the most value include: large private land acreage, hunt any time during the season, the hunter makes his own success. Many hunt pictures are deceptive in the workload and time to have a successful hunt. Showing only the results of a good hunt to the unknowing is to conceal the homework before the scouting, the scouting effort, equipment load, specialized calling, decoying and camouflaging skills required to achieve those results. Those without experience or equipment may find the Association’s buddy hunt list a means by which to team up with those that have experience and equipment. Those that are experienced hunters willing to work with others and wanting additional hands also find the buddy hunt list worth the time to try. Some considerations to make the buddy hunt a success in terms of making eh first trip earn repeat hunts. Many of the Association hunters are willing to take on one, not a group or family, but one fellow member at a time. A number of reason for this include any one person has just so much energy to commit to another. Then the issue of limited equipment comes into play. Most goose hunters have an older, extra ground blind to share, but that is typically the extent of the helpful hand. Remembering the overall structure of the Association is the self guided hunter implying a self resourcing capability. 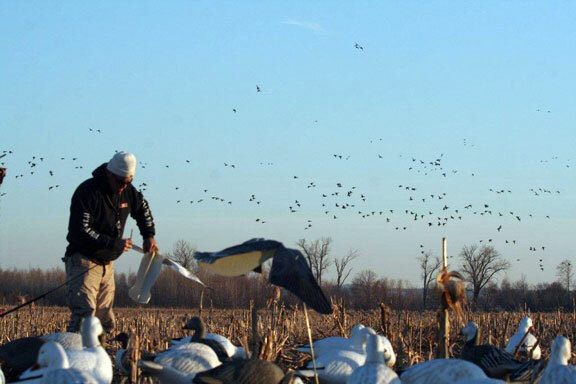 courtesy of an understanding of waterfowl regulations, bringing the right shells, gun, etc., includes a willingness to work placing and taking up a spread. Being prepared to operate in mud and more. provide some of the niceties of hot drink and meals. These points are not intended to scare off those that may never have but want to try an unguided hunt for geese. It is the unknowing really have no understanding of what they are getting into. There is a lot more to these hunts than any collection of articles could ever represent. That is part of the adventure to be enjoyed, not riled against. Many small points add up over time when working with those traveling for a hunt as well as working with those just starting to refine their hunts. One such point is not to over look the weather conditions seen in the pictures of flocks. The sky is clear, the sun is bright. Cloud cover and wind is the enemy of the better hunt. If there is a wind, the general consensus is a south with is good. A second point of pictures showing the larger flocks is the ground cover, brown, not white. Reading on to the next page gets into the nuance of when and where to plan a spring Snow Goose hunting trip. Better than average spring Snow Goose hunting is to understand the distinctive geography of the region made available by this Association. The Association provides the large acreage within the Lower Missouri River Basin covering northern Missouri (80,000 acres), southern Iowa (24,000) and eastern Kansas (several thousand more). Have a look at land form maps showing the Central Lowlands of the better crop fields and surface water areas. 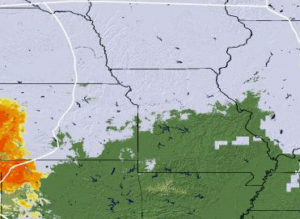 In this region of the better hunts the Association has the bulk of its private land in Missouri. This tends to concentrate hunters into this region leaving our Iowa and Kansas private land less pressured. In any case of picking where to start the hunt based on available acreage is the wrong approach. Go back to the waterfowl reports and determine if the geese are more north, south, east or west and then scout that region. 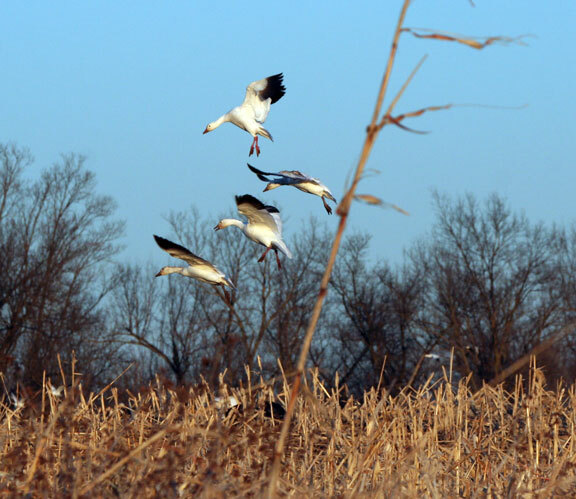 This is no small point as Missouri seems to get the most press space on waterfowl further motivating more hunters to look there. The capability of this Association having land covering a wide portion of the Central Lowlands extending beyond state lines is the value to be gained in terms of more opportunity. Ground accumulation real time mapping is available to all through the http://www.nohrsc.nws.gov web site, subject Regional Snow Analyses: Midwest. Showing clearly white and brown ground. A last point that we have seen over the last 20 years or so is the effect of the snow line on migration. This has been both an advantage and a consequence depending on how used. On any winter the line is somewhere and that line seems to frequently make for the better hunts below it rather than above it. Within the Lower Missouri River Basin that we seem to need to remind folks extends into Kansas and Iowa, that line is frequently present, somewhere. Adding that line’s location to the migration reports should add further to narrowing down where to scout. All of the previous was where to hunt. When to hunt is always another matter. It was the increasing number of southern waterfowl hunters traveling north to meet the ducks that educated us on the value of natural enhanced wetlands over their more common flooded field duck hunts. We had always just called our wetlands, wetlands. 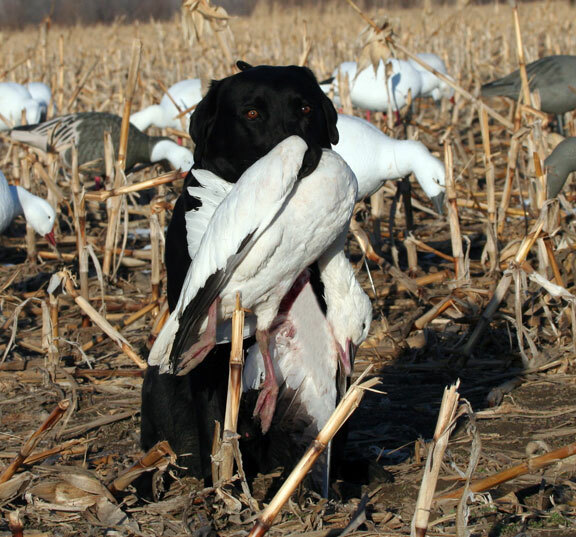 The southern hunter taught us how our Missouri waterfowl hunts are over enhanced natural wetlands are what they would prefer to hunt down their way if available rather than their flooded field duck hunts. Or, what we call field duck hunting up our way minus the flooding. In terms of our waterfowl hunts the common approach of those with the most gray hair is to concentrate on ducks during the regular season. The Association enhanced natural wetlands and permanent blinds being a strong attraction. It is common to have the occasion lucky day in some of our blinds on the larger pools to collect a limit of Canada geese. 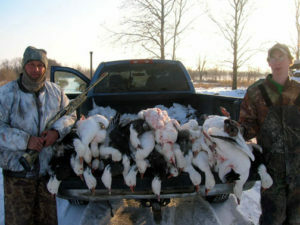 The late goose season is largely a Canada hunt with some snows. The bulk of the spring Snow Goose hunting is generally the last half of February through the first half of March. That is the ballpark timing or the point before and after of when to concentrate on the migration reports. The optimum time would be when the migration is moving. That period of fresh birds unfamiliar with the locality being less spread/call/gun shy. Conversely, the worst time would be during layover. The longer the layover period the less potential for the better hunt in terms of shot opportunity. Another of one of those not so small of points. Seeing geese is not nearly as challenging as getting a shot on the geese seen. This timing refinement again shows the value of this Association. For all of us on limited time schedules having the ability to first flex to where the geese are is a value point. Combine that with the ability to move away from the well known waterfowl refuges (more pressured birds) another value point. Add that to our acreage extending to the north to south, west to east regions of the Central Lowlands gives the flexibility to combine with migration, ground conditions and weather to narrow down to the always changing better localities of where to hunt. This is getting deep into the nuance of this art. The point being past prior experience of good hunts does not equate to predicting future better hunt locations when the hunt is for nomadic or migrating prey. 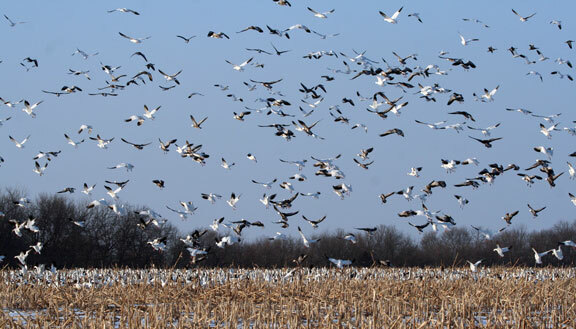 Just like all waterfowl hunts, we the Association, recognizes it is dependent on weather and migration. The capability the Association brings to the hunter superior to other approach’s beyond our expansive private land is the ability of the unguided hunter to hunt on his schedule, anytime and for as long as wanted during the entire season. Flexibility on two counts. The first is the large acreage in the right geographic area, the second is the entire season is available to the hunter. Really not much to stand in the way of success after some good scouting. That is for those that have the willingness, equipment and skill. A more rare combination than it appears on the many spring Snow Goose hunting shows on cable. 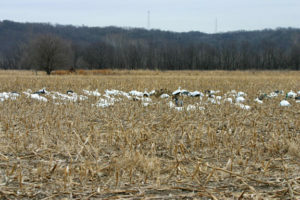 A photo of geese working the fields on a recent spring snow goose hunt. Quality private crop fields on a prime flyway is a must, but putting together a successful hunt requires tremendous effort and gear. Maverick with one of his many retrieves. 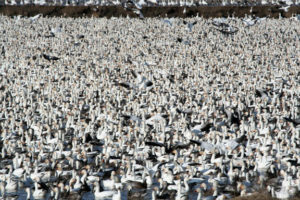 Many hunters talk down snow goose hunting since the degree of difficulty is beyond their capability. 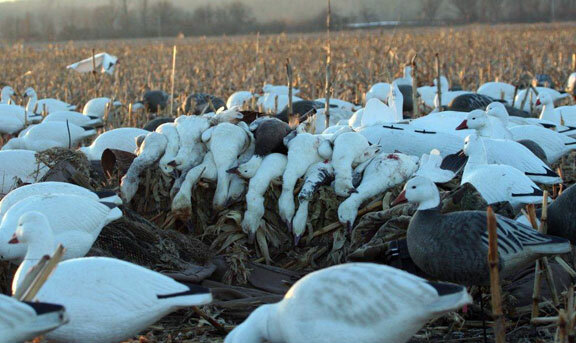 Once a flock commits to a decoy spread, it's an experience that's hard to beat. 15 birds in the bag, a good day for anyone especially Mav.